07 Feb Hey Green Works! Biophilic Design in the Workplace. Why do we so often choose to stay indoors, or feel a desire to ‘protect’ ourselves from the outside? When considering office spaces we stereotypically imagine long rows of computers, plastic chairs on wheels, the sounds of the printer and keyboards tapping, fabricated lighting imitating the bright skies outside and a sense of enclosure. If we look at animals kept in cages and artificial surroundings we feel a great level of discomfort and think surely they would be happier in their natural habitat? The answer is yes, and so would we! Typically spending up to 40 hours a week in our office environments, these spaces have a huge impact on our daily lives. With research further exploring the negative effects our surroundings have on mental and physical behaviours, it is time to re-consider the traditional workspace in favour of nature and clean Biophilic design. Here at MOSS we strive to implement as much green as possible in a bid to bring nature in. This article explores the many theories encompassing Biophilic integration in the workplace and how we may resolve the current issues in favour of a greener future. Business psychologist firm, Robertson Cooper have spent a lot of time researching the optimum workplace, how to motivate employees and to create a valued working environment. Notably their study on Biophilia – ’How Natural Design can Enrich the Office and Engage Staff,” which explores the biophilic perspective on what makes us feel good in our office each day. The response suggested a 15% increase in reported ‘well-being’ when workers are exposed to natural elements such as greenery and sunlight. This acknowledgement is not at all shocking when put alongside a 2006 American biological study which proves the positive, physical effect that natural elements such as plants and sunlight have on our brains. As subjects were left to admire a green planted environment their brains triggered a positive response in comparison to their negative observation of a blank wall. Architect, Professor Ihab Elzeyadi’s studies for the University of Oregon even showed that nearly 10% of employee absences can be attributed to architecture with no connection to nature. So the solution seems simple, bring nature indoors? Careful planning and consideration of green integration is important. Reconsidering an office space to suit both humans and plants involves challenges, particularly surrounding sunlight and moisture levels. However weighing up the benefits of green integration in the workplace makes the outcome invaluable. Strategies may include integrated planters, grow-lights and green walls, with every piece of green and drop of sunlight becoming a dramatic improvement on our physical and mental wellbeing at work. 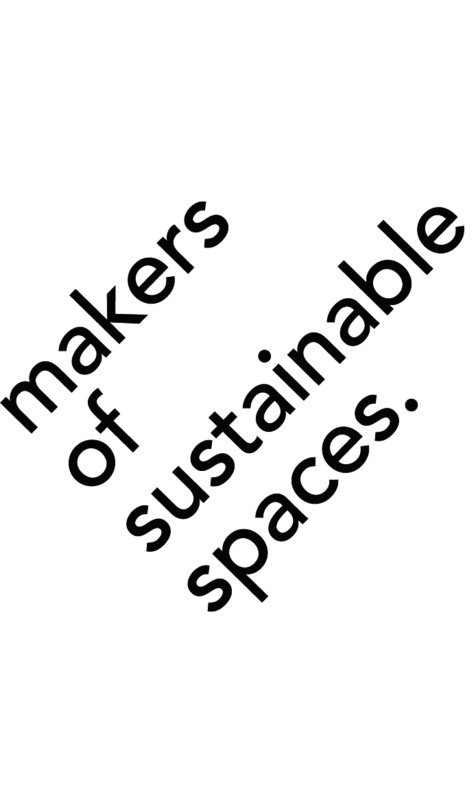 We (MOSS) treat plants as the centre point of every decision and step we take, having experienced green workplace design firsthand we are confident in the physical and mental improvements that it makes on those using our green spaces. 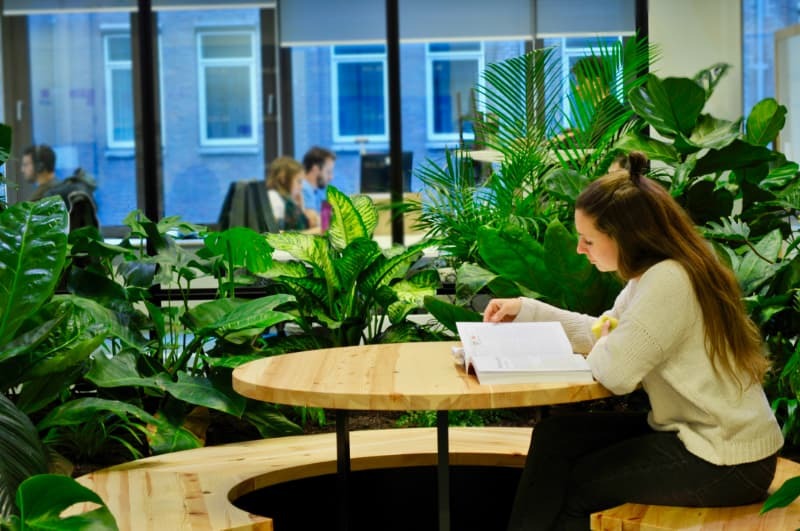 An ideal example of this would be the green jungle we designed at the JOOLZ office here in Amsterdam. An enormous ‘green lung’ stretches itself through these bright and open-plan office spaces, feeding the interior with fresh air, natural colours and an exciting centrepiece in which users can interact with nature. 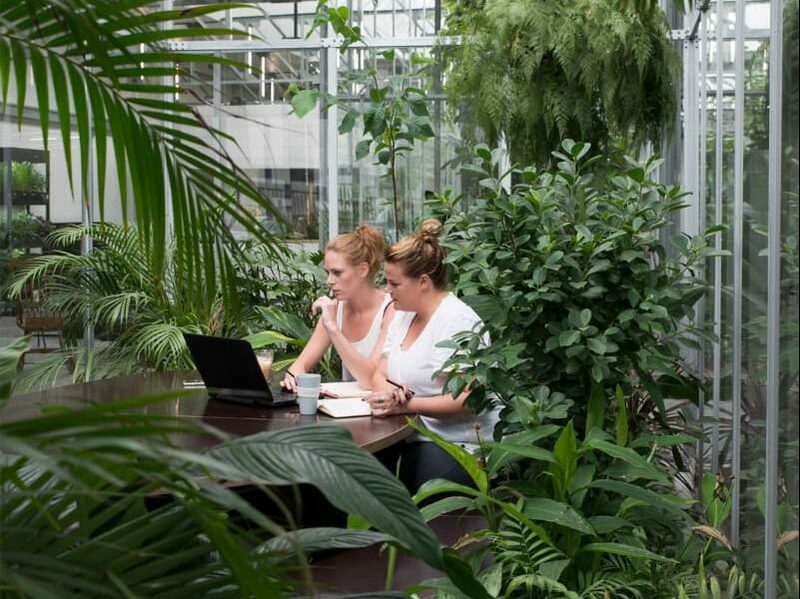 The team at JOOLZ can step away from their desk into Jungle Greenhouses! Employees spend an average of 5 hours in this space every week which is great when we look at a study by psychology researchers at the University of Michigan which points towards an 20% improvement in memory and attention span after spending only 1 hour in nature. It is unquestionable that the natural power of plants benefits not only our mental health but furthermore our companies health. Having spoken to the employees at JOOLZ we were excited to hear that the happiness, concentration and stress levels all improved since working in their new green environment. We also contacted one of our friends, Jade Goldsmith, at the recently revamped Booking BANK office in the city centre of Amsterdam. 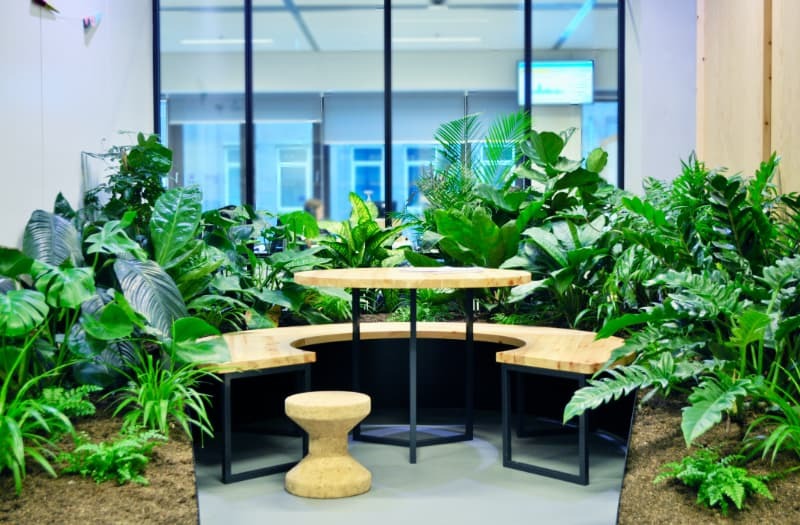 In this office of Booking, MOSS designed and installed a couple of tropical gardens, where employees can have a small meeting in between the green. Her preference to work within a green and pleasant working environment definitely had effect on her career decisions. Previously working in a cubicle, day in day out, was secluding her from her peers and overall joy! ‘White walls scream stress to me’ she mentioned. That is why sometimes she just takes her laptop and go to one of the green spaces at Booking. ‘I feel more relaxed and focused there’. As a manager at Booking, Jade also likes calling her team to chat within garden zones. The mood is better in these green spaces, she describes. “I particularly like this one plant wall… it looks more like a restaurant than a work space.” Implementing informal green areas in office areas can help employees feel more at ease, to take a the edge off. When it comes down to high concentration work though, Jade says the green space paired with her noise canceling headphones are magic! Does green help you get in the zone, too? Further research into our mental response towards biophilic integration carried out by Stanford University in 2015 proves that a simple walk in nature can in fact lower the risks of depression. This outcome illustrates the importance of ‘a green escape’ and perhaps if we want to create an even stronger impact to interior green, we might consider also improving our exterior areas. Take our example of B. Building Business in Amsterdam. A restored office building that hosts a secret rooftop garden. Employees are able to explore scented gardens, walk amongst tall grasses and alongside ponds it is possible for them to really escape in nature without leaving the footprint of their office space. These natural spaces, however small or uncomplicated make a dramatic improvement on our employees well-being, business infrastructure and importantly our sustainable future. The environment around us is changing quickly, the pace of our cities is faster and our working hours longer. We must schedule green into our lifestyles in order to keep peace with our planet and also our minds! Biophilic design is not a temporary architectural ‘fashion’ but it is here to stay, in order to create happier and healthier working environments we must say goodbye to traditional workplace design (cages) and bring the outdoors in.